"I will act with honor, and I will fight to clear my good name." 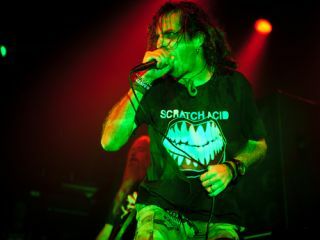 Lamb Of God singer Randy Blythe has returned to his hometown of Richmond, Virginia, following his release from a Czech prison. In June, Blythe was arrested and incarcerated for five weeks on suspicion of manslaughter related to a May 2010 incident in which a fan died after being allegedly pushed from the stage by the singer. Greetings. This is D. Randall Blythe, checking in from my beloved hometown of Richmond, VA, United States of America. I was recently released on bail from Pankrác Prison in Prague, Czech Republic, after over a month of incarceration. Now that I am out for the moment, I would like to say a few things. 1. While in prison, I had minimal knowledge of how my case was viewed anywhere but the Czech Republic. I was told by my attorney that I had a lot support from peers in the music industry, my hometown, fans, and of course my family. I cannot express how emotional it made me upon my release to read about even a fraction of the voices that were raised on my behalf. From legends in my music community, to fans across the world, and even people who were previously unaware of my existence but sympathized with my plight - I am truly humbled. I cannot thank you enough for your thoughts and prayers. I would especially like to thank the people of Richmond, VA, for standing by me. In the 48 hours I have been home, many people I have never met before have stopped me on the street, waved and smiled as I passed by, or said hello in a restaurant. All have said "We are glad you are home, Randy". You all make me proud and grateful that I call Richmond home. 2. I would like state that I suffered no abuse, from either authorities or inmates, during my incarceration in Pankrác. I received no special treatment, and was in general population with everyone else- make no mistake, it was prison, not some celebrity rehab tv show. But I was treated fairly by the guards and kindly by my fellow inmates. People are dying of starvation all over the world. Men and women are losing their lives daily in the Middle East and other war torn regions. I had food, clothes, shelter, and no one was trying to kill me. I cannot complain over a short stay in prison while many people elsewhere fight to survive on a daily basis. 3. If it is deemed necessary for me to do so, I WILL return to Prague to stand trial. While I maintain my innocence 100%, and will do so steadfastly, I will NOT hide in the United States, safe from extradition and possible prosecution. As I write this, the family of a fan of my band suffers through the indescribably tragic loss of their child. They have to deal with constantly varying media reports about the circumstances surrounding his death. I am charged with maliciously causing severe bodily harm to this young man, resulting in his death. While I consider the charge leveled against me ludicrous and without qualification, my opinion makes no difference in this matter. The charge exists, and for the family of this young man, questions remain. The worst possible pain remains. It is fairly common knowledge amongst fans of my band that I once lost a child as well. I, unfortunately, am intimately familiar with what their pain is like. Therefore, I know all too well that in their time of grief, this family needs and deserves some real answers, not a media explosion followed by the accused killer of their son hiding like a coward thousands of miles away while they suffer. I am a man. I was raised to face my problems head on, not run from them like a petulant child. I hope that justice is done, and the family of Daniel N. will receive the closure they undoubtably need to facilitate healing. I feel VERY STRONGLY that as an adult, it would be both irresponsible and immoral for me not to return to Prague if I am summoned. This is not about bail money. This is about a young man who lost his life. I will act with honor, and I will fight to clear my good name in this matter. Thank you for reading this, and I wish you all peace.